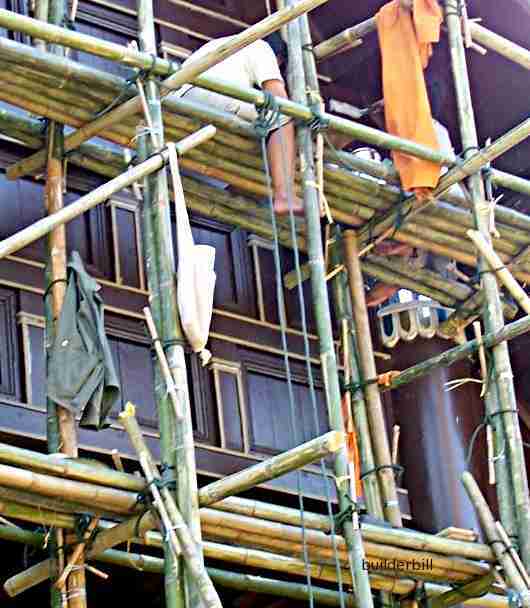 Bamboo poles used as scaffolding on a temple in Chang Mai, Thailand. Bamboo is said to be the fastest growing plant. It is in fact a type of grass that is widespread all over East Asia. Apart from it's swift and easy cultivation, it is has a great strength to weight ratio making it ideal for the purpose shown here. The temple shown here is not extremely old, but if it was say, two thousand years old, the chances are that bamboo would have been the scaffold used to build it. This scaffolding is not totally traditional. You may be able to see that the lashings at the joints are done with cheap poly rope, tightened with a small stick of bamboo used as a tourniquet. A rare site indeed in modern Singapore. July 2009. Bamboo tied in the traditional way with strips of bamboo for lashings. Note the use of safety mesh an steel plank for a kicker. The rest of the planks on this small job were also steel. 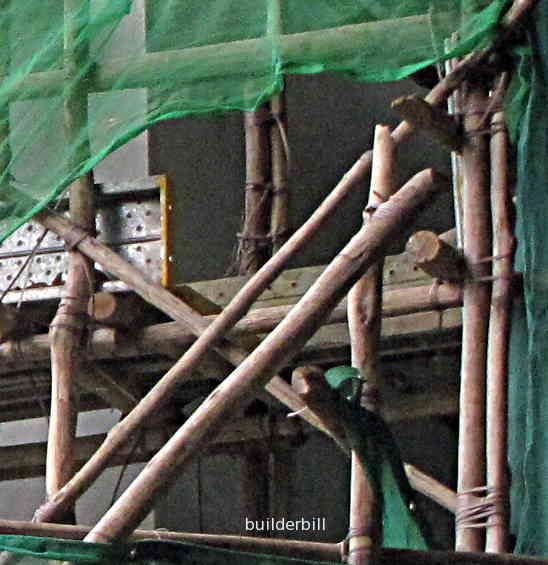 I have seen guys erecting this type of scaffolding with bunches of thin bamboo strips about 2ft-3ft long tucked into their belts, and they seemed to be making the joints with the flexible strips just as quickly as guys in Western countries using modern pipe clips and spanners.